“Homesickness is like most sicknesses; it will pass.” So says the kindly Fr. Flood (Jim Broadbent), as he tries to console Eilis Lacey (the Oscar-nominated Saoirse Ronan) — a young Irish girl who has emigrated to Brooklyn. Weeks earlier, Eilis left the small town of Enniscorthy in County Wexford with a combination of excitement and expectancy, but adjusting to America proved to be a challenge. She did not know anyone in Brooklyn, and the very rhythm of life there was different — faster, more anonymous, alienating. Making matters worse was her mother’s frail health, which her sister was now left to tend to on her own. Thus Eilis had confided in Fr. Flood, hoping that he would encourage her to return home to Ireland. But he does just the opposite, enrolling her in bookkeeping classes and requesting her involvement in the local parish. “We need Irish girls in Brooklyn,” he jokes. The importance of “home” is, indeed, the key theme in Brooklyn. What makes a place “home”? Is it just somewhere you live? Or is it determined by something else — something indefinable, amaranthine, even mysterious? And, if so, need it be limited to one place? Can one have two homes? Eilis is faced with precisely this conundrum. 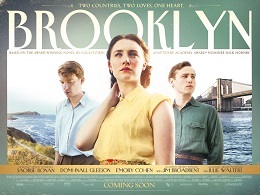 At a parish dance in Brooklyn, she meets Tony (Emory Cohen, who imbues his role with winsome earnestness), an Italian-American plumber who soon comes to love Eilis even more than he loves the Dodgers. Slowly but surely Eilis gives in, not just to Tony, but also to Brooklyn. They look forward to a future together — perhaps a home on Long Island — and Eilis’ homesickness dissipates…just as Fr. Flood predicted. But, then, bad news arrives from Enniscorthy, and Eilis is forced to return to her family. Commercial air travel is still not an option, and the visit promises to be lengthy. Hoping to seal their relationship, Tony presses for a private civil marriage, to which Eilis agrees. Yet, upon reaching Ireland, Eilis finds herself swept back up into the flow of her “other” home: once overlooked in Enniscorthy, she is now the center of attention — the girl from New York. She is offered a job, invited to parties, and eventually courted by a gracious and well-to-do bachelor, Jim (Domhnall Gleeson). No one knows about Tony, and Eilis even begins to ignore his letters. Maybe Enniscorthy really is home? Director John Crowley sets up this scenario with palpable, even old-fashioned romanticism, and it’s to his credit — along with the performances of Ronan, Cohen, and Gleeson — that Eilis’ dilemma is felt so deeply. But what of the dilemma itself? Brooklyn, of course, works on various levels. In one sense, it chronicles an experience that is so characteristic of the modern West — that of emigration, of leaving one’s home to start another elsewhere. Yet, beneath this socio-historical level, there is also the issue of home itself. Here Brooklyn is somewhat more ham-handed, chiefly because it does not properly account for Eilis’ final decision. This is a significant flaw in terms of the story’s plot, but it does little to change its theme. In the end, Eilis realizes that home is more than a dwelling, more than a place where one is raised. No, home is a goal, a destination, for home is where love is most profoundly realized. Brooklyn, it is true, does not theologize this point, but it’s hard to miss its allegorical import. Christian mystics have long understood the spiritual life in terms of exitus and reditus — “exit” and “return.” Just as the individual, in being born, exits from her divine origin, so is the goal of her earthly life to return to the love from which she came. But this divine love is not just a starting point; it is also the “site” where she is truly known and made complete. That such an abstract, metaphysical scheme should overlap with a “love story” may seem surprising. And yet, Christians have long seen marriage as a sacrament of God’s love for humanity. Thus such stories — especially ones as sincere and moving as Brooklyn — are always already more than the sum of their parts. In highlighting the importance of one’s temporal home, they gesture toward the eternal one that grounds it.